Benjamin from Brighton Jaguar & Land Rover contacted us after discussing a customer’s requirement for a Ski Rack with Baden Cooke. The next day we paid Benjamin a visit armed with a SeaSucker Ski & Snowboard Rack. 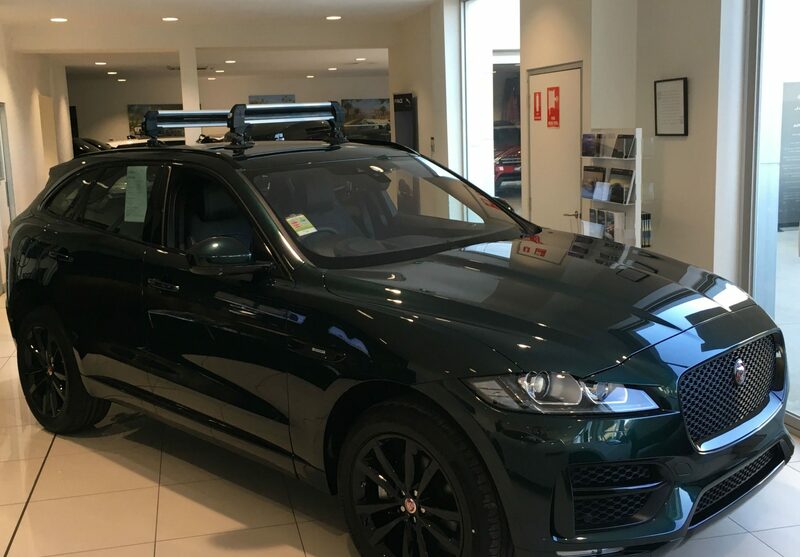 Benjamin’s customer had purchased a new Jaguar F-Pace with a full glass roof. As a result, it was not possible to install the factory roof rails. We demonstrated the power of SeaSucker Vacuum Mounts by lifting a loaded filing cabinet off the ground using one 152 mm Vacuum Mount fitted with an aluminium handle. 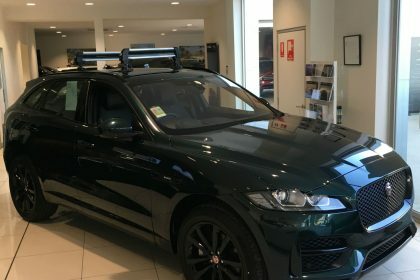 After examining the Jaguar F-Pace in the showroom we chose to mount the SeaSucker Ski & Snowboard Rack as shown in the photos. 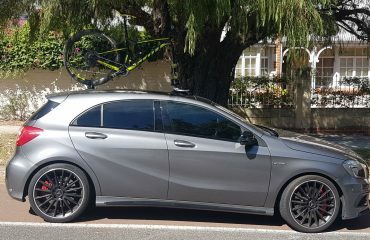 An alternate location would be to install one Ski Rack on the fixed glass roof with the other rack directly above the rear aerial. 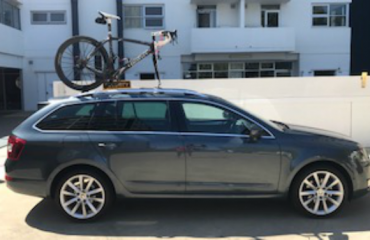 This product makes an ideal Jaguar F-Pace Ski Rack. The Vacuum Mounts on the SeaSucker Ski & Snowboard Rack pivot enabling the Ski Rack to work on highly curved rooflines. 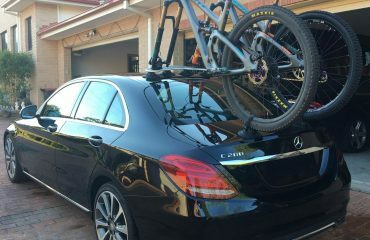 The SeaSucker Ski & Snowboard Rack has 615 mm of internal capacity. It should accommodate two sets of skis or a set of skis and one Snowboard. Given its height, you could store your skis on top of each other. This will depend on the height of your bindings. Thank you Benjamin and the team for the opportunity to demonstrate the SeaSucker Ski & Snowboard Rack.